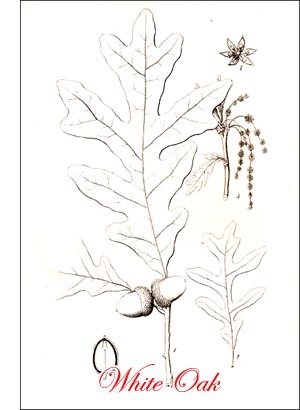 White Oak (Quercus alba, Linn.) --A large tree, 60 to 150 feet high, 3 to 8 feet in trunk diameter, tall in the forest, low and broad domed in the open fields. Bark pale grey, broken into small, thin plates. Wood tough, strong, heavy, hard, durable, light brown, with prominent medullary rays. Buds short, round, smooth, clustered at tip of twigs. Leaves alternate, 5 to 9 inches long, obovate or oblong in outline, with 7 to 9 rounded or fingershaped lobes with deep, rounded sinuses between; petioles stout; colour red at first, with white silky lining, then bright green above, paler beneath; in autumn deep red. pale purplish beneath. Flowers in May, with half-grown leaves; staminate catkins, hairy, 2 1/2 to 3 inches long, yellow; pistillate, 1 to 2 on short stems, stamens bright red. Acorns annual, on short or long stems; cup shallow, thin, with closely appressed scales; nut of long, shiny, brown, 3/4 to 1 inch long, Sweet, edible. Preferred habitat, rich, welldrained soil. Distribution, southern Maine to Florida; west to Minnesota, Kansas and Texas. Uses: A lumber tree of highest rank. Its bark is used in tanneries in the making of leather. The wood is used in naval architecture, in house building and inside finishing, for furniture, agricultural implements, cooperage, railroad ties and fuel. The white oak is the noblest tree of its race; king by common consent, in our forests of broad-leaved trees. It is the embodiment of strength, dignity and independence. The Briton has but one native oak on which to spend his loyalty and devotion. We have fifty kinds-all American-but the white oak is chief among them all. In this opinion the lumberman and the tree lover generally concur, and each, as he gazes on a fine old tree, feels the smouldering fires of ancestral tree worship flame once more in his breast. There is something in Anglo-Saxon blood that remembers. We shall know the white oak in the winter woods by its pale grey bark, with shallow fissures and scaly ridges. It is a tall, narrow-headed tree where it is crowded among its forest neighbours. In the open it has a sturdy, low-branched trunk that flares into buttresses at the base and supports a rounded dome of great breadth and dignity. The mighty arms reach toward the horizon or the sky, breaking into tortuous limbs and these into dense thickets of twigs. Over these is the luxuriant thatch of fingered leaves, through whose narrow sinuses the light sifts so freely that even the inner framework of the dome bears leafy twigs. The characteristic arrangement of these leaves is a tuft of them on the end of a twig, spread out like the divisions of a horse-chestnut leaf. In spring a shimmering veil of rose and silver covers the grey old tree. The edges are fringed with the yellow tassels of the staminate flowers. From the axils of the opening leaves the forked tongues of the pistillate flowers are thrust out into the pollen-laden air. All summer the leaves are bright green with pale linings. In autumn the red comes back again with bluish tones that blend into beautiful vinous reds and violet purple. Gradually the colour fades out, but the leaves usually hang on until pushed off, even as late as the following April. We shall find no acorns on white oak trees in winter, for they mature in a single season, and fall without delay. The crop is usually a light one, and it is hard to find acorns even under the tree. The sweet-flavoured nut is a favourite food of animals, wild and domestic. The Indians and the early colonists ate them. These shrewd and provident ancestors of ours discovered also that this "ackorne" had other good qualities. "By boyling it long, it giveth an oyle which they keep to supple their joynts." They skimmed this oil from the water before they ate the acorns in the pot. White-oak lumber is becoming rare and correspondingly high priced. Its quality is of the first order. Clear, quartersawed oak exhibits a higher percentage of the "mirrors" (pith rays) than any other species. Its durability, hardness and fine colour are exceptional among oaks. So great is the demand for it in the finer decorative arts employing wood that it is going out of use in general construction where inferior woods can be substituted. Roots of white oak, sawed, planed and polished, present a wood of extraordinary beauty. It is pale yellow in colour, tinged with olive, and shows a feathered grain of intricate and graceful pattern. The lustre of it is equal to that of mahogany or rosewood. Fifty years ago Nuttall cited an instance of an English cabinetmaker paying five pounds sterling for the roots of a single tree, counting that furniture veneered with it would vie with the finest.